Our 2018 Class Schedule is not only up, but online registrations for most courses are now open. If the class you are seeking is not open for online registrations, please call or email us to reserve your place, as seating is limited in all courses. We already have a few classes filling up, so don’t miss reserving your space. For 2018 we have training in Hawaii, Southern California, Central California, Northern California, Oregon, Colorado, New Mexico, Maryland (Washington DC region). Classes per a year are less than years previous to 2014, as our founder/instructor – Tim Lewis – has limited availability to teach. He had planned retirement a couple of years ago, but the law enforcement community requested that Tim continue bringing his expertise to the classroom and his hands-on, in the field training approach. As previous students know, one cannot beat Tim’s enthusiasm, passion, knowledge, and hands-on training style in these courses. Rolling Surveillance, which is also known as physical or mobile surveillance. Rolling Surveillance II, our advanced foot surveillance. Chop Shop – Auto Theft Investigations and Criminal Sophistication, gaining knowledge and experience needed to bust auto theft rings. Undercover Field Operations, a course to help you create your undercover police profile, plan operations, work informants, etc. We are accepting registrations and reserving spaces for our training courses for 2018. Be sure to check it out, share it with your training coordinator or task force and nail down your placement, as we keep our class sizes limited to provide the best quality instruction. Our advanced police techniques and hands-on street practice is perfect for officers seeking to promote, as well as those serving as investigators, detectives, and working undercover police assignments. Task forces will benefit from training together for team building. Time is running out for the early bird fees on Advanced Rolling Surveillance training. RS II increases foot follows/switches across airports, on light rail, bus depots, etc. You will pursue a realistic terrorist scenario and learn even more mobile surveillance techniques. You will implement creative coverage during hands-on training. Did you think Rolling Surveillance was intense? This is RS taken up a few notches! Albuquerque, NM the week of Oct 23-27, 2017. We are now planning our class calendar for 2018. If you are interested in scheduling our training at your agency, now is the time to call or write to us. We have a hosting/contracting class page which gives more information. By booking a course at your agency, you save your department travel costs, per diem, and even some tuition (depending on course and size you receive 1-2 free placements). You do not pay extra for our travel/lodging either, as it is all included in the registration costs per attendee. It’s a win/win! We limit the size of each class to ensure excellent hands-on instruction per a student. and possibly an IOCCRA Conference (Investigation on Organized Crime and Criminal Activities) as we did annually in the past, if you have a facility large enough in a major city. We have enjoyed traveling through the country and meeting so many amazing training coordinators and dedicated law enforcement officers through the last 14 years. We are looking forward to another exciting year of instruction in 2018. You can join our mailing list to be updated on upcoming courses. A big thank you to North Las Vegas Police Department for hosting us to teach Rolling Surveillance and for all the officers who participated. In July we had another wonderful visit to the exciting streets of Las Vegas, NV. It’s one of Tim’s many favorite places to teach out in the field, as they have everything needed for thorough hands-on training in the same area. Of course it was scalding hot and the city was extra busy, no rental cars to be had, because the Black Hat “Information Security” Conference was going on at the same time. On the upside, some of the role players were given free upgrades on their hotel rooms and didn’t mind one bit. Vegas is always brimming with energy, which is fitting for Tim’s non-stop energy when teaching. However, even the heat taxed him some, as I’m sure it did everybody involved. Nonetheless, thank you again to all who came out to help make Rolling Surveillance a huge success. If you have taken Rolling Surveillance, now is the time to register for advanced surveillance training before the end of 2017. The number one request we have from Rolling Surveillance attendees is for more days with more foot follows. The advanced course is more intense than the first…action-packed, fine-tuning not only your mobile surveillance skills, but also your foot follows. Airport set-ups and taking the target away with creative coverage techniques and counter-terrorism tactics. Fast paced, intense, with planning and reactive decision-making! 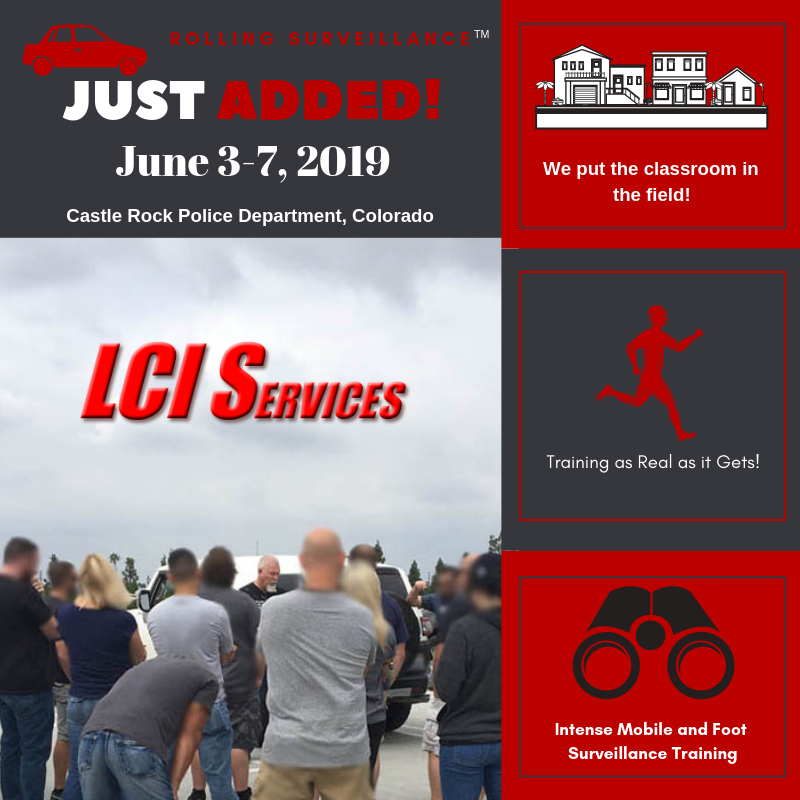 Be sure to check out our schedule, as we only have two advanced surveillance and responding to counter-surveillance courses left for this year. One in Southern California in September, and the last one of this year will be in New Mexico in October. We hope to see you there.